Purple Rain Salvia has dark red stems loaded with purple flowers that bloom from early summer to early fall. It has grey-green aromatic foliage. It will grow to a height of 16" to 18" and 12" to 18" wide. Plant Purple Rain Salvia in full sun in moist, well drained soil. Purple Rain is a magnet for butterflies, bees and hummingbirds and is deer-resistant. It is hardy for container gardening and provides excellent cut flowers. Use Purple Rain Salvia in a mixed perennial border, massed in a perennial bed, in a Rock Garden or a Cottage Garden. 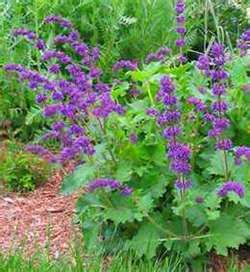 This Salvia also works great as a ground cover.